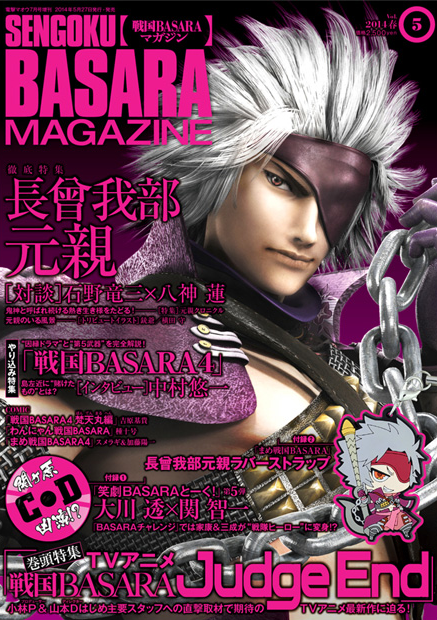 Sengoku Basara Magazine issue five is now out in Japan and the first rumours are spreading online about its content. I'll post a full review once my copy arrives but here's a summary of what I've heard so far, starting with the official information now the magazine's website has updated. First of all, there's a new cover illustration. A novelisation of Sengoku Basara 4 is coming on 10th July 2014 priced at ¥680 titled Sengoku Basara 4: Ryuuou-Kamewari-hen ('Dragon King/Urn-Splitter Arc'). The plot is said to focus on Date Masamune and Shibata Katsuie and it will be packed with original stories. Takase Mie is handling writing duties and illustrations will be provided by the talented Haibara Yak. The magazine's sixth issue will be dated 'Summer 2014' and feature Mouri Motonari on the cover, rubber strap and character profile. The main article will cover the Sengoku Basara: Judge End (Sengoku Basara -Judgement-) anime and there will be a photo report from the last stage play. The manga chapters will be Sumeragi's Mame Sengoku Basara 4 (Shucchouban), Yoshihara Motoki's Sengoku Basara 4: Bontenmaru-hen and Tane Jugou's Wan-Nyan Sengoku Basara. Ookawa Tooru (Tokugawa Ieyasu) and Seki Tomokazu (Ishida Mitsunari) will return for the Showgeki Basara Talk! Ieyasu & Mitsunari No Maki Vol. 2 bonus CD. A rerelease for Sengoku Basara 4 will be coming in July? A listing has appeared online at retailer Nojima which appears to announce a rerelease for Sengoku Basara 4. The new 'Sengoku Basara 4 Special Package' will come out on 24th July 2014 for ¥4,849 and include the game, all nine of the DLC costumes and a special video DVD. In addition, the game will have the option to unlock all characters right from the start (this feature is currently available separately as paid DLC). Since this hasn't yet been formally announced there's no word on which videos the DVD will include. The pack is timed to match the month of the anime's release so Capcom must be hoping to attract some new fans. 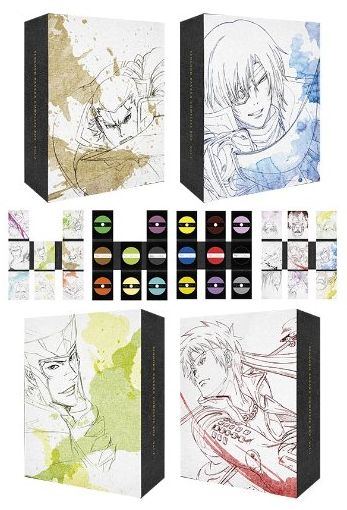 Amazon has posted a small picture showing how the items inside the new Japanese Blu-ray box set will look when it's released this July. Very nice!